Many advisors, clients (especially those in younger generations), and asset managers have turned their attention to socially responsible investing (SRI). It's commonly known in the investing community as ESG (environmental, social, and governance) investing, and maybe you've noticed some increased interest among your clients. But can it really be a worthwhile style for investors, or is it just one of those trends in investing that will pass us by? To answer these questions, let's take a look at how far ESG has come over the last decade. With growing interest in ESG, particularly in the last five years, asset managers specializing in this type of investing have reaped the benefits. 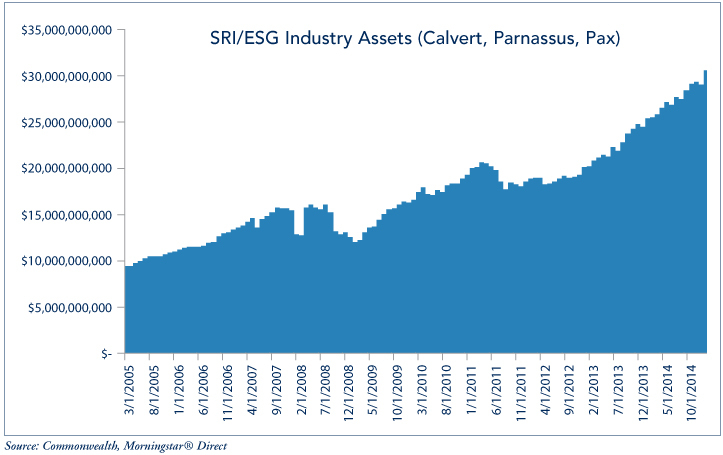 As the chart below shows, three leading SRI/ESG managers—Calvert, Parnassus, and Pax World—have seen significant growth over the last decade. In fact, their total assets have increased by almost 225 percent! Conversely, the asset management industry as a whole grew only 157 percent over the same period, according to Morningstar® Direct. The top three managers based on assets under management—Vanguard, Fidelity, and American Funds—have had collective growth of only 143 percent over the last decade. Here at Commonwealth, we've seen a similar trend. As the primary analyst covering SRI/ESG strategies, I have seen advisor and client interest in the space increase significantly over the past five years. In fact, assets in our program now stand at around $60 million. But what sparked this increased interest? Since the financial crisis in 2008, the industry has seen a growing trend away from the "hands-off" style of investing that prevailed among clients. As account values plunged and Ponzi schemes were exposed, clients began to scrutinize their advisors and investment choices, adopting a more hands-on approach. Increasingly, clients are focusing not only on how they're invested but also where they're invested, all the way down to individual securities within a mutual fund. It's not news to anyone that Joe Main Street is more concerned with his investment choices these days than he was in 2003. With this added level of scrutiny, there appears to be a growing awareness of ESG investing. You may be thinking, "That's great, but performance suffers, right?" Not quite. Domestic performance. 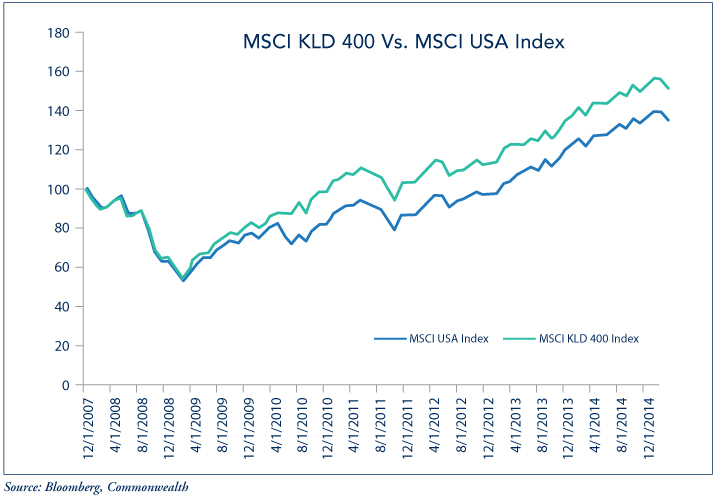 The chart below shows the performance of both the MSCI USA Index and the MSCI KLD 400 Social Index since the onset of the Great Recession. (For those unfamiliar with the latter, it's simply the MSCI USA Index with an ESG overlay.) When discussing performance, it's appropriate to use indices rather than actual mutual funds; this illustrates relative performance without an active management component affecting returns. The chart shows pure passive investing and passive investing with an ESG overlay. You can see that a $100 investment in the ESG index accumulated more assets since December 2007 than did an investment in the traditional MSCI USA Index. International performance. Turning to the international side of things, a similar picture emerges. 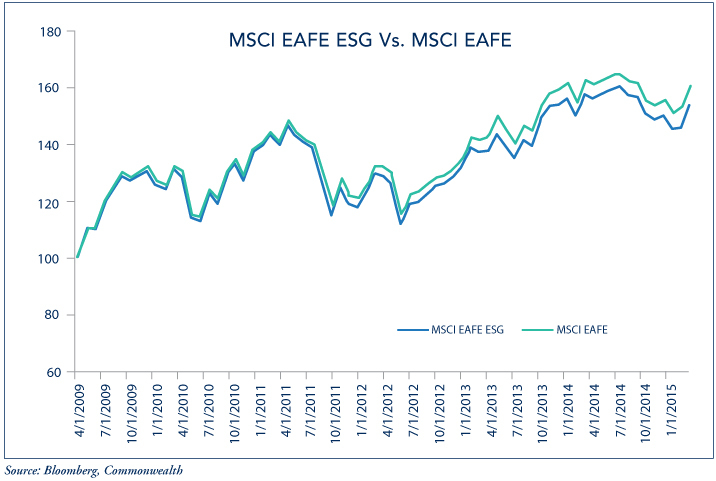 Since its inception in April 2009, the MSCI EAFE ESG Index has outperformed the traditional MSCI EAFE Index. And as you can see from the chart below, that outperformance appears to be increasing as of late. Clearly, ESG overlays have helped both domestic and international performance, as both ESG indices have outperformed their traditional counterparts since inception. Be an active owner and incorporate ESG issues into ownership policies and practices. Seek appropriate disclosures on ESG issues by the entities in which it invests. Work to enhance effectiveness in implementing the principles. 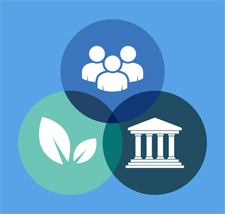 Report on activities and progress toward implementing the principles. "This recognition forms the foundation of our approach to investing responsibly. It is also consistent with our conversations with a growing number of investors who now regard ESG as a fundamental component of the way they invest—a basic principle of their approach to investing." ESG is something of a new concept in the domestic retail arena. But incorporating ESG factors has been an integral part of the process for quite some time in Europe and Australia, as well as among U.S. foundations and endowments. There is a growing interest from (and actual investments made by) pension funds, accredited investors, and family offices that weren't previously associated with this style of investing. As an analyst who attends many investment symposiums across the industry, I have witnessed the change firsthand. Five years ago, a great way to get out of a stale conversation at a cocktail party following all-day meetings was simply to mention SRI or ESG investing. These days, that's no longer the case. There are some out there who call it a fad—but I would say it's here to stay. Do you think socially responsible investing is here to stay? Have you seen increased interest in ESG from your clients? Share your thoughts with us below. Investing in the stock market involves gains and losses and may not be suitable for all investors. The investment's socially responsible focus may limit the investment options available to the investment and may result in returns lower than those from investments not subject to such investment considerations. All indices are unmanaged and investors cannot actually invest directly into an index. Unlike investments, indices do not incur management fees, charges, or expense. Past performance does not guarantee future results.